What kind of pain can be seen in this clinic? How to get an appointment? Who I will talk to? We decided to add an update section to the main pain of the website. Please check the website for NEWS about chronic pain and about Allevio pain management. 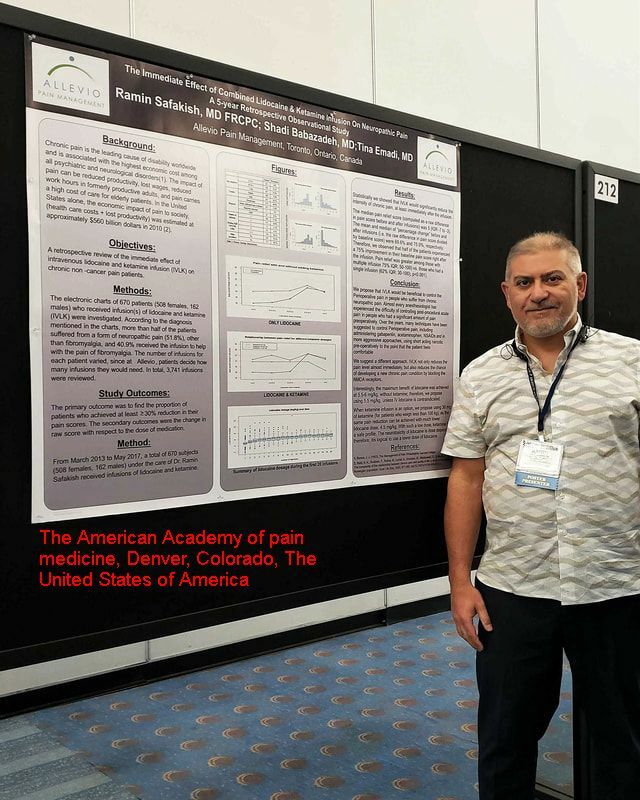 Last weekend we presented posterior in a very precipitous conference for chronic pain, at the American Academy of pain physician meeting. Overall it was an excellent a fortunately to present Allevio pain management and how findings. As well, we explored the opportunities for collaboration with several universities in the United States of America. Fortunately, after a long discussion, Allevio pain management illegal team could provide intravenous lidocaine infusion for people who use TTC Wheel-Trans for transport to Allevio pain management. For more information, please call and talk to one of the admin staff. You have power over your mind - not outside events. Realize this, and you will find strength. Referral form; fill by family doctor. Dr. Ramin Safakish, MD, FRCPc, is one of the several full-time anesthesiologists who works in Allevio Pain Management. If you want to see him personally as a consultant, your doctor MUST mention that in the referral letter. You would need to be patient in that case since his waiting list is longer than a few months. However, if you want to be seen sooner than later, your family doctor would refer you to Allevio Pain Management team and the first available consultant would see you. - Played for many Volleyball teams - Last one was Ahvaz University. ​- continue played volleyball all those years- in 1987 our University team did stand in the 3rd place in the Championship tournament of all Iran's Universities. Over the last 3 year, each Wednesday, I had the pleasure to see patients outside of Greater Toronto Area. Not everyone whom I've seen was a new patient. In fact, many of them are my old patients who have many years of pain relief after the last RF procedure, and they inform me how productive and happy they have been since after the RF procedure. The news of your happiness is my greatest joy, and makes me feel that I am a very fortunate person. My job is the best in the world. I am not giving up. PLEASE do not forget that the fuel for my engine is your smile. Many of you already know that I suffer from chronic pain. For many years I felt angry, but not anymore. I treasure this pain as it is a gift that opened my eyes to your suffering. So please know this fact, you are among friends in our clinic. Next year I would focus on publishing some of my knowledge, techniques and cases that could help other professionals all over the world helping pain patients. Tele-Medicine in Ontario continues to be my home every Wednesday. Therefore, anyone in all Ontario can be seen for consultation by one of our other 5 doctors or me. The only requirement is having access to one of the many sites of Tele-Medicine. One of the greatest news last year was the agreement of 3 OTN sites for having a dedicated day for our clinic. It means for instance in Chatham; every Wednesday Chatham-Kent Alliance has dedicated the OTN facility and OTN nurse to Chronic Pain. For seeing a pain patient by one of our pain specialists, simply Allevio receptionists can book patients in a precise opening in Chatham without being worried about the availability of the OTN facility. This agreement has been one of out greatest achievements in the treatment of Chronic Pain in Ontario. It would not be possible without passionate nurse manager in our clinic and kind and understanding OTN coordinators at those specific OTN sites. I would like to thank all the people who try to make the life of a chronic pain patient, easier. If this option is interesting for you, talk to your doctor or check WWW.OTN.CA.